A short distance on the A415 followed before I turned towards Aston. I turned off this road onto a very beaten up road to Old Shifford, more a farm track than a road in places, a bit rough and muddy but isolated and pretty. The road then had an excellent new surface alongside the Great Brook, a side channel of the Thames, this was an idyllic stretch of lane cycling. Probably the best bit of the ride. I turned south onto the Buckland Road which was pretty busy and to Tadpole Bridge where I took a breather and found Flush Bracket 112 and took photos. The only real hill on the entire route into Buckland was next but pretty easy, didn’t need to drop to the granny cog for this one. After Buckland I had to cross the busy A420 again, took a while for a gap in the traffic to appear so I could scoot across and to Charney Bassett. I was onto roads that have become familiar now, I used the handy bridleway bridge at Southmoor to recross the A420 and the secret tunnel at Fyfield to go back under it again! I was cycling well as Tubney, Frilford Heath, Gozzards Ford and Shippon followed. A small distance of town cycling through Abingdon was left (isn’t it odd how as soon as you get to the towns cars no longer give you any room when they pass, yet in the country most follow and pass slowly and carefully). I used the NCN route on Peep-O-Day Lane to get back to Sutton Courtenay. My longest solo ride, nearly 50 miles when I add on the bits that GPS-Sport decided not to record. I really enjoyed the latter half of this ride, the B-road cycling early on was less good but necessary to get to the good bits. Usual commuting route with an added loop at the end of the morning through Wallingford which adds about a mile to the total distance. On the way home I was really cycling well so added on a loop via Drayton and Milton which adds about 1.5 miles to the total distance. Really noticing the fitness improvements now. The morning ride to work was glorious, the Sun was just rising and surrounded by the Chilterns and Berkshire Downs it was beautiful. The wind was behind me too! You can see the difference in average speeds between the morning and evening due to the wind! It was pretty strong but I did my usual 17 miles route to and from work. In my never ending quest for variation in routes I stole another route from the Wantage CTC. They rode this almost exact route on 1st November as their ‘moderate’ ride. I was interested to see whether I would keep pace with what they manage. They averaged 13.3 mph on the route, I did 15.02 mph which was faster than I expected. I wasn’t keeping track as I cycled as I wanted to see what it would be and I wasn’t especially pushing hard. The route started in Sutton Courtenay and went via Milton and under the A34 and up Milton Hill. Using Featherbed Lane as a cut to the A417 there was a brief section on the A-road before turning thorugh West Hendred. Heading up to the highest point on the road close to Ginge and along the very quiet lanes to Ardington and Lockinge. Crossing the A417 onto Grove Park Drive fast downhill past Lain’s Barn. I took a short break where the road crosses the old Wilts & Berks Canal, I was looking for an OS benchmark which is on the old bridge access but didn’t find it. There was a brief heavy shower, the weather had been bright but breezy up to then. I then joined familiar roads through Grove, Denchworth and Charney Bassett. I had to cross the A420 at a staggered junction at Fyfield and then I was on the long fairly dull section through Appleton and Eaton I had done a few weeks before. Back across the A420 at Bessels Leigh and through Wootton on the B4017. The wind was now against me for the final few miles through Sunningwell and Radley. The final stretch was through Abingdon town centre and along the A415 to Culham where it started raining again. But I was only a few minutes from home. Not too bad a route, some of it is a bit boring and there aren’t many climbs, I wonder if the Wantage CTC average speed includes all the stops? The main distinction of this ride to work on a grey November day was that my front light is rubbish. I couldn’t see a thing on the way home as this was the first commuting ride since the clocks went back. I still did the full 17 mile route, but boy it was dark on the country roads! The picture isn’t my light, I have been using an old battery light, this is my new light! Normally £300 the nice man in Rides on Air in Wallingford sold me his last display model to me for £150! 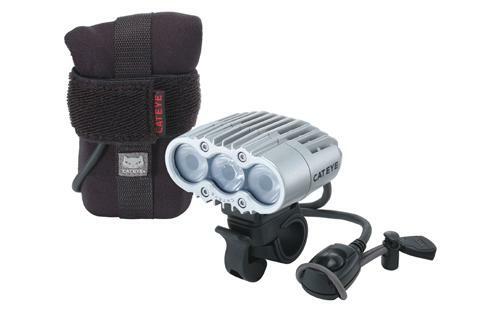 I was going to buy the £65 Cateye rechargeable light but couldn’t resist the bargain. Not had a chance to try it out yet but it looks pretty impressive. The other thing to note today is that I officially broke the 500 mile training distance. So I’m halfway to John O’Groats already! After recent hilly rides I picked a very flat route for this Saturday ride. But this was wind-training rather than hill-training as there was a bitter and strong NE wind blowing. It was grey and drizzly as I cycled from home via Drayton to the Hanneys. The Hanney Road was extensively covered in mud from tractors, which was slippery in the damp conditions, and with the crosswind it wasn’t the most pleasant stretch. From West Hanney I turned north into the wind and cycled via Lyford and Charney Bassett to join the B4508. This is a very quiet B-road, I barely saw a dozen cars all the way through Hatford, Shellingford, Fernham and Longcot. This was the wind assisted stretch as I was heading southwest. Of course that meant I had to head into the wind all the way back! Through Uffington and Baulking the weather was thinking about getting worse but it was a lovely stretch with the White Horse on top of its hill in sight all the way on my right. I had to join the A417 for a few hundred metres before turning through Goosey and Denchworth. Soon I was back in West Hanney to repeat the open stretch back to Steventon. With the wind coming from my left threatening to push me into the centre of the road and even more mud on this side of the road I was glad to get that bit done safely. I turned right in Steventon to take in the only hill on the entire route, the short but steepish hill up to Milton Hill which I descended on the A4130 and under the A34 at Milton Interchange. Through Milton and back home. Shortly after getting back home the heavens opened for a truly miserable afternoon and evening so I got the ride done just in time.